Yes, it's nearly Halloween, and El Diablo dog is disguising himself as a pumpkin to avoid the ghosts of past unholy collie-terrier unions. Wise werewolf. Peel and dice the pumpkin. Cover with water and cook for 20 minutes until tender then drain and mash with the butter, cinnamon, ginger and nutmeg. Make sure it is smooth. Leave to cool. Meanwhile, mix together the sugar, warm water, egg and yeast. Once the pumpkin mixture is lukewarm, combine all the ingredients and knead. The mixture can be quite wet at first. The best advice I've had is to start mixing and kneading with a spatula and give the flour time to absorb some of the liquid. If needed, gradually add extra flour a little at a time on your hands or in the bowl and knead in until you have a smooth dough. Cover and leave for 10 minutes to prove in a warm place. Punch down and divide the dough in two. Knead each half and place into two greased 1lb loaf tins. Cover the tins with a tea towel and leave in a warm place until the dough has doubled in size. Enjoy toasted with lashings of butter, Marmite or jam and try not to eat the two loaves before you get a chance to take a photo...ahem. This year, mini pumpkins (munchkins) are available at Wiston Church, including the adorably named 'Wee Be Little'. It's worth a walk over to Wiston to enjoy the autumn colours and return home with pockets of pumpkins. They also act as excellent improvised "go fetch" balls if you are uncoordinated enough to drop them near annoyingly fast werewolves with vegetarian tendencies - a socially acceptable werewolf if ever I've met one. Happy baking and Happy Halloween! Yesterday, whilst wearing my regulation "it's November, it should be cold" outfit (three fleeces and a waterproof) I was wolf-whistled at by a man towing a cattle trailer. I was as surprised as you are, but this can only mean one thing...bring on the mince pies! And no Verity, you cannot use shop bought pastry. Save yourself some money and go crazy with some shortcrust. Mix flour and salt in basin, rub in fat. Using a knife, to cut and stir, mix with cold water to form a stiff paste. Turn dough on to a floured board/worktop and roll out. - from the Be-Ro bible. Personally, I think lids are a waste of pastry (I am that cheap), so it's stars or dinosaurs, or whichever shape cutter/mould comes to hand - some still retaining the kryptonic strength of dried-on homemade play dough. Or if you have that much time on your hands, you can create Edible Boggle (minus the shaking). Way more rewarding than actual Boggle. In other news...progress on the barn restoration. 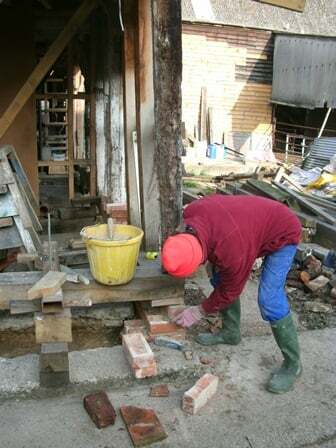 The brickwork is nearly completed thanks to Dad and Jack, our Master Bricklayer. 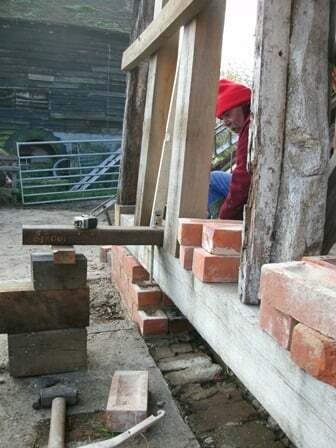 Over the past two years, Mum and Dad have made incredible progress to ensure the barn remains standing for another few hundred years. 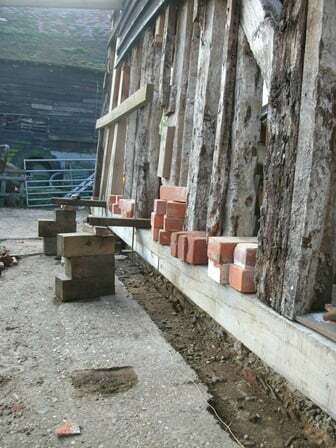 Through courses run by Essex Heritage and led by the excellent Richard Green of Green Restoration, we've been able to repair the rotten sole plate in three places and shore up the barn. 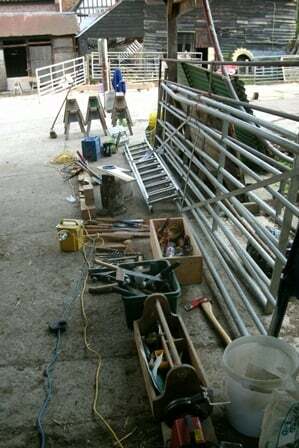 After the marathon effort of all the attendees on the last course, we've got a lot to do but it will be worth it! We'll be adding more information and background to our website, but here is a quick photographic rundown to get you up to speed and show you our most recent progress. And Richard, I'm not that good with Photoshop, the brickwork is real! The race is on to get it shipshape before the weather turns...!